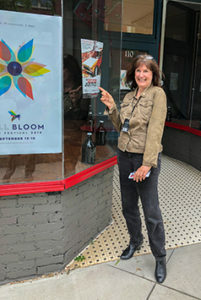 The same weekend as the Charlotte Film Festival (see below) we screened at the Footcandle Film Festival in Hickory, NC. We spent the weekend driving back and forth between Hickory and Charlotte trying to get as much of the film festival experience in as we could. 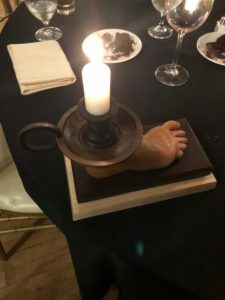 We have to say, the Footcandle FF folks go all out. The festival caters primarily to the 700 members of the Footcandle Film Society. They love their films! We were the last film of the festival and had over 100 people in the audiece. Chris, who also did a lot of driving that weekend, came back for the Q&A. Sadly, she didn’t stay for the closing dinner. We had great conversations with the folks at our table and we were shocked and delighted when we won the Audience Choice Award. Yes, that’s it on the right. Gregg was speachless. Fortunately, Jamie was able to jump right in and let everyone know just how much that means to the project. The last weekend of October, 2019, was BUSY! 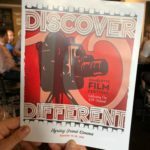 On Friday, the 28th, we screened the film at the Charlotte Film Festival. The cool thing about this festival is that all of the screenings took place at a multi-plex. And it’s the first time we’ve needed to supply a “DCP” – which stands for Digital Cinema Package, yes, the same format Hollywood uses. And the film looked and sounded awesome. Oh, and the audience loved it too. Chris Mumma drove in from Raleigh for the Q&A. It was a long drive but the audience loved it. 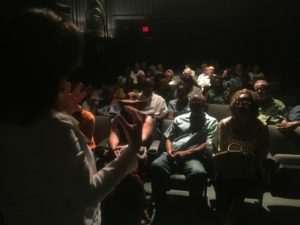 On Sept. 14th we screened our film during the Hurricane Florence edition of the Full Bloom Film Festival in Statesville, NC. Yes, we got a little wet, but no where near as wet as people just a little bit east of us. It was a great festival with awesome, historic venues. Thanks to our friend Justin we were able to get some posters up before we arrived. And the Q&A was awesome. What an engaged audience! And if you are ever in Statesville looking for a place to eat we highly recommend Risto’s Place. It’s “farm to table” and the staff there treat you like family. One note though – if you don’t love the Steelers this may not be a place for you! The first festival Greg Taylor – Ghost was accepted in was the Down East Flick Fest back in 2016. Since then we’ve supported the festival whenever we could. This year, once we knew the film was done, we called Celestine and asked her if she wanted to screen the film. We were delighted when she said yes. We had a great screening on Friday, July 20 and Gregg participated in a panel of filmmakers (with Jamie participating from the audience) the next day. We had two awesome screenings at the River Run International Film Festival in April, 2018 – the first at SECCA (just 11 seats short of a sellout), and the second, at the Hanesbrands Theatre (which was a complete sellout, including adding another three rows of seats on the floor). The photo on the right is of our “Audience Choice” Award!! Thank you Winston-Salem for coming to see our film. November 16th was a busy night for us. We had two events in one night. 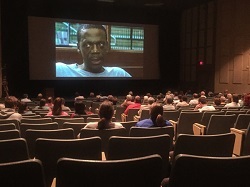 The first was a special screening for Leadership Winston-Salem’s “Justice Day”. 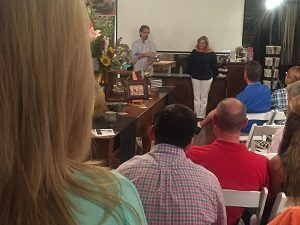 Nearly 40 members of their 2017-18 class and alums attended and, even if we do say it ourselves, were enthralled. And the Q&A was out of this world. Great, heartfelt questions and responses. We can’t wait to show it to the rest of the class! 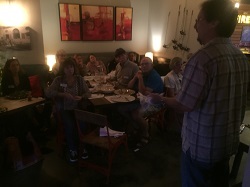 Our second event on the 16th was a “house party” screening arranged by our awesome supporters, Eva Wu & Randy Royer. 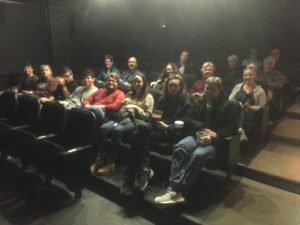 As a special treat we arranged to hold the screening at Ovation Sound – so not only did attendees get to see the film, meet Greg and Chris (after they sprinted from the LWS Q&A in downtown Winston), they got to tour Evan’s studio. And it was a great event for us because we raised over $1500 towards the James G. Hanes Memorial Fund Matching Grant! September 14th we were back at the Hanesbrands Theatre in Winston-Salem. Nearly 70 people chowed down on popcorn, drank a couple of adult beverages, and screened the film. Director of the Wake Forest Innocence & Justice Clinic attended with some of his students. (Yes, that is Mark on the screen!) The best part was that Chris and Greg were in attendance and did a stellar job during the Q&A. And yes, we had a small reception prior to the screening for folks got to meet Greg and Chris! It was very cool! August 10th we screened the film for Dean Richard Leonard’s first year law students (class of 160!) at Campbell University’s Norman Adrian Wiggins School of Law. He’d heard about the film while attending the North Carolina Advocates for Justice conference in June. Campbell is one of our film’s “quiet” stars, Greg’s hearing was held in the courtroom in their facility. We’ll be back at Campbell to screen the film for their student innocence organization later this fall! 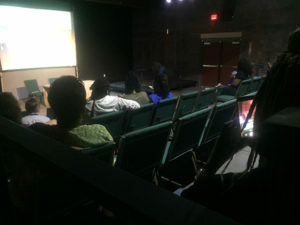 August 3, 4, & 5 we held work-in-progress screenings at the National Black Theatre FILM Festival. Nearly 50,000 people came to Winston-Salem from across the country to celebrate Black Theater. 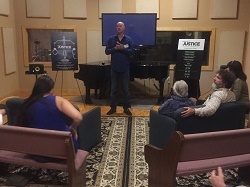 We were honored to be invited to screen In Pursuit of Justice in front of their audiences. We had full houses every day, in spite of the early 9:30AM screenings! And the Q&A’s were robust and engaging. Special thanks to Kathryn Mobley, the film festival organizer, for arranging everything and for inviting us. We enjoyed “talking shop” with other filmmakers, too! Insider tip: keep an eye out for the Turner Brothers and their company Dreadhead Films. These young men are going to go far! 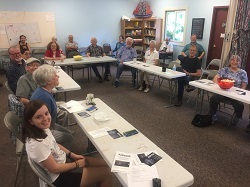 Sunday, July 17th, we presented at the Unitarian Universalist Fellowship of Winston-Salem. We showed our new trailer and a ten-minute sample of the film. As those of you who have seen the film know, the story is a wee bit complicated, so we then spent another 45 minutes explaining everything else that happens in the film! Even then, it is a great discussion starter. If you have a church group that would like to explore criminal justice issues let us know. We’d be happy to help foster the conversation. We’ve been told repeatedly that one great way to spread the word about the film is to attend conferences. 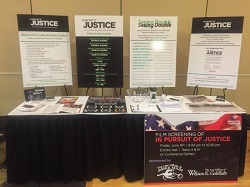 June 16 – 18 we attended the North Carolina Advocates for Justice Conference in Sunset Beach. Over 300 defense lawyers attended the conference. We screened the film Friday evening and spent Saturday and Sunday talking to everyone who stopped by the booth. We’re pretty sure that the majority of those in attendance have now heard of In Pursuit of Justice! And, no, we didn’t make it to the beach at all! Work! Work! Work!!! June 8th we headed to Mooresville and the Four Corners Framing & Gallery. Special thanks to Robert Campbell & Kim Sarogoni for hosting us. The audience was engaged, especially during Greg and Chris’ Q&A, and the food was AWESOME! One funny thing, there’s a scene in the film where we use some footage of an NCIIC hearing to illustrate a few lines about the adversarial process. Well, who should show up in that footage but Robert (he is an attorney and was working with Chris on a case). We had totally forgotten that he was actually IN the film! 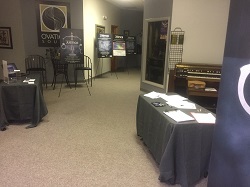 We headed back to Ovation Sound on May 25th. We try, for every screening, to have pushed the film a little bit further. It may be as simple as correcting a spelling mistake (you know how hard it is to proofread your own work! ), or the addition of new music, or a bigger re-working of the film’s content. Of course, the closer we get to completing the film the fewer changes there will be. If, like a lot of our supporters, you haven’t seen the film since January, it will have changed a lot. All for the better we hope! What do you do when, arguably, the largest paper in the state, The Raleigh News & Observer asks if they can screen your film? You say, “yes!” of course. 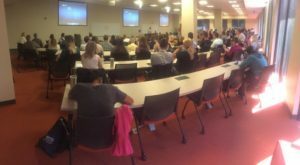 April 26th we screened the film at NC State University to an audience of over 150. It was especially exciting for us because Johnny Beck was able, for the first time, to attend the screening. (Johnny is seen on screen in the picture on the right.) 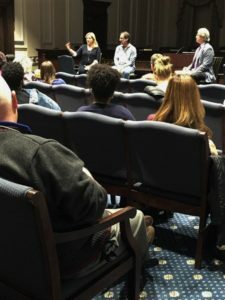 The screening was part of the N&O’s “Community Voices” series. On APRIL 18th, supporter, Lynn Rohrs, played big! She set up a special screening of Greg Taylor-Ghost at Treforni Restaurant in Durham. What a great evening! The conversation was awesome and the food incredible. Greg Taylor came, devoured a pizza, and mesmerized everyone with his story. Thank you, Lynn, for putting this event together. On MARCH 30th we took the film to Composer Evan Richey’s studio, Ovation Sound. What an awesome, intimate venue in which to screen the film. Appetizers and wine, courtesy of PNC Bank, where, coincidentally, both Evan and Gregg bank, started off the evening – and, for the folks who stayed around, finished the evening off, too. Needless to say, the music sounded awesome! On MARCH 21st we headed back to the Hanesbrands Theatre. Perhaps needless to say, we get lots of great help putting on these events. Here Jamie is talking with that evening’s volunteers Patty and Tom Ricono, Megan Shuford, Sun Kneppelt, and Melody Thompson. This evening’s screening was sponsored by Pinnacle Key Group of Winston-Salem. Thank you so much for supporting this project! 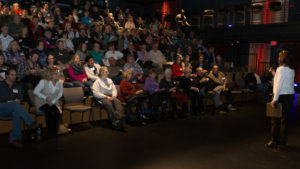 MONDAY MAR 13th on a cold rainy evening we held a work-in-progress screening at Durham’s Arts Council Theater. Of course, Durham is Greg & Chris’ home town so the screening was packed with friends and relatives. Not to mention a couple of judges and law enforcement folks. Chris and Greg, as usual, led an engaging Q&A. And afterwards, what else, pizza and wine! MONDAY FEB 6th at FYLWHEEL’s new location at Center for Design Innovation near Salem College over forty donors attended a party to celebrate the completion of our “Rough Cut Riders” fundraising campaign. 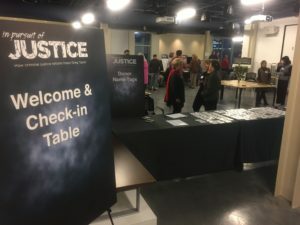 Attendees were wined and dined, got to see Greg Taylor – Ghost, and see two new clips featuring Yolanda Thomas, the sister of Jacquetta, the woman Greg was wrongfully convicted of murdering. You can see the clips here. a/perture cinema is a great venue for us, especially petite 3. What a better way to spend a weekday afternoon that watching a work-in-progress screening of our doc! Which is exactly what we did on Ground Hogs Day. Our audience included a group of School of the Arts screen writing students. And an incredible group of, we are sure, new advocates for the film! Our WIPs always have time for questions – and we frequently find a watering hole nearby to relax in afterwards. Not everyone can take a weekday afternoon off to attend a screening. 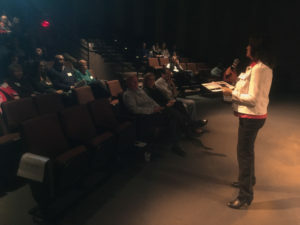 On January 5th we held a Work-in-progress screening at the Hanesbrands Theatre in Winston. We received some great feedback about the film and some excellent constructive (the best kind) criticism. The Q&A with Greg Taylor and Chris Mumma was awesome. And it was incredible to have so much of Greg’s family in the room. 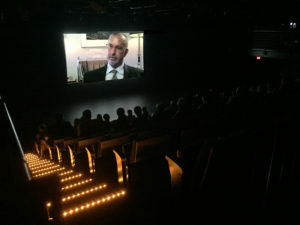 It was the first time we have been able to screen the film for them. COMPLETED! Dec 8th,2016 at A/PERTURE CINEMA. WOW! We had a great time at the first “Work-in Progress” screening for the feature film in a REAL theater. 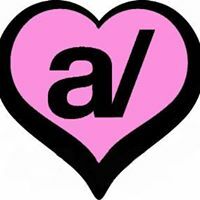 Thanks so much to Lawren Desai, owner of aperture, for supporting local filmmakers. We were so happy with the turnout for this midday event. Viewers had enthusiastic and constructive comments. The follow-up texts, emails, and donations are deeply appreciated. We also appreciated the special service we got at Hutch & Harris for the lunch before the film and also at Jeffrey Adams for the bar service for our post-event discussion. It was a great day for us! 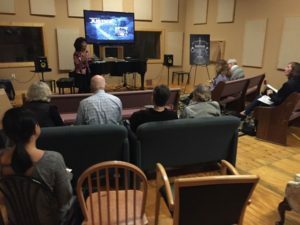 COMPLETED EVENT:MONDAY NOVEMBER 28, 2016 6-8pm “GREG TAYLOR – GHOST” Screening plus “IN PURSUIT OF JUSTICE” UPDATE / FILM CLIPS The brand new “CREATIVE COMMUNITY LAB”- part of the Keenan Institute for the Arts at UNC School of the Arts – & Sunny Townes Stewart were generous hosts for this intimate gathering of people interested in seeing footage from our bigger film project. 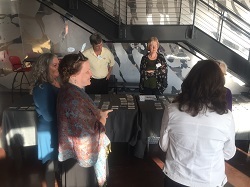 We had great conversations with several people NEW to the project – always a plus to add new folks to the list of our supporters. We appreciated the support from donations and the warmth of hugs. We always enjoy seeing people be moved to tears by our doc short Greg Taylor- GHOST – an emotional piece we pulled from the bigger film and had success with in 6 film festivals. COMPLETED: MONDAY Nov 14, 2016 “GREG TAYLOR – GHOST” was screened at the Unitarian Universalist Fellowship of Winston Salem plus we did an “IN PURSUIT OF JUSTICE” UPDATE that included a 10-minute trailer from the feature length film. We all got to hear new original music composed by Evan Richey of Ovation Sound with this version of the trailer. Evan is one of the reasons we are fundraising; he hopes to score the film. Thank you to the UUFWS for the use of their facility. 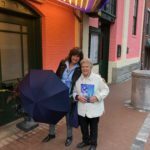 Thank you also to Janet Joyner – a local activist on many issues – who shared why she has been moved to support this film. 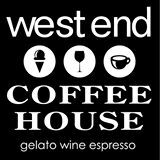 COMPLETED: FIRST WAVE Campaign Wrap-up Party Held Thurs / Nov 3, 2016 at West End Coffeehouse A gorgeous evening, music on the patio, 35 attendees (16 new to the project – exciting! ), more generous contributions made – an overall wonderful night for us chatting with people on the documentary’s status. We showed off our new banner, posters, and postcards. We already had 2 full posters listing FIRST WAVE Supporters to share with people. Many thanks to all who came,questioned,supported, & enjoyed themselves! Special thanks to owners Dana and Jim Moody for being our hosts and contributing their space to our project. It was a great night. 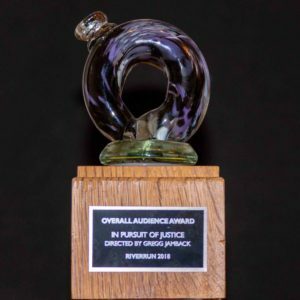 “IN PURSUIT OF JUSTICE” Media Launch Was a Big Success! COMPLETED: Wed / Oct 19,2016 was a “Drop – In Event” at “Coffee Park ART” at Rhodes Ctr for the Arts. 60 guests dropped by! 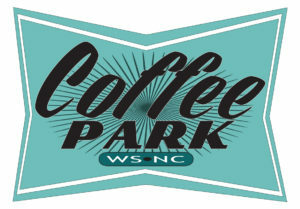 Coffee Park Art staff and owner Tommy Priest were wonderful hosts. We showed off our new marketing media. 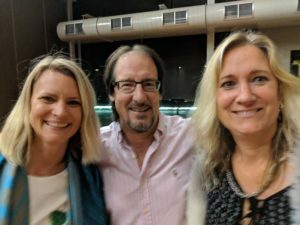 Folks got to meet Kristie Staton/Creative Force – the graphic designer for our multiple print materials and our new website. Mitch Termotto and Scott Dahlin of Express Graphics generously provided support by printing our new posters while also becoming FIRST WAVE supporters by making a direct donation to the project. Thank you to everyone who attended. FIRST WAVE Supporters can be found scrolling on our Home page.